I arrived at Calgary’s Peace Bridge on Sunday, July 19, 2015 just before sunrise and shot this photograph. The cool morning tones with just a hint of pink sky in the background, along with almost even lighting, creates an interesting photograph. 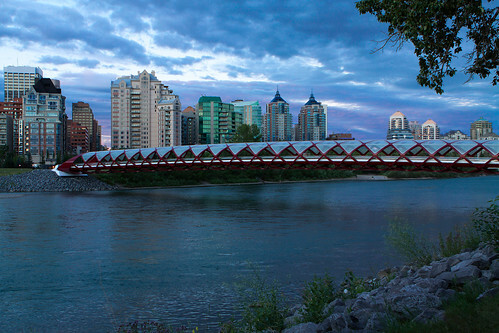 For those who are not aware, the Peace Bridge is a pedestrian bridge that crosses the Bow River in Calgary, Alberta. Santiago Calatrava is the architect who designed the bridge. Because of its costs and delays, it was a controversial project. Despite its initial issues, I like its striking design. Although I have been busy, I wanted to share with you this latest photograph.